Elephant Atta is rolling out new packaging for it’s entire range of attas from December 2017. The new pack design is a fresh, modern take on the brand’s 50 years of tradition that emphasises the premium quality of the atta, yet maintains the warmth and emotion of the brand’s family values. 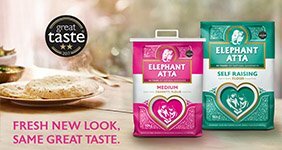 The premium new packaging still packs the same great tasting, premium atta that has won Elephant Atta Medium and Elephant Atta Self-raising 2 gold stars at the prestigious Great Taste Awards 2017. The same great taste that has firmly established Elephant Atta as the nation’s favourite brand amongst British Asian families, with 53% of market share*. Marine Yborra, Senior Brand Manager at Westmill Foods, says, “Elephant Atta is an iconic brand with a strong heritage. Our new packaging reflects the premium quality of our award winning atta without losing the brand ethos of standing at the heart of the family”. 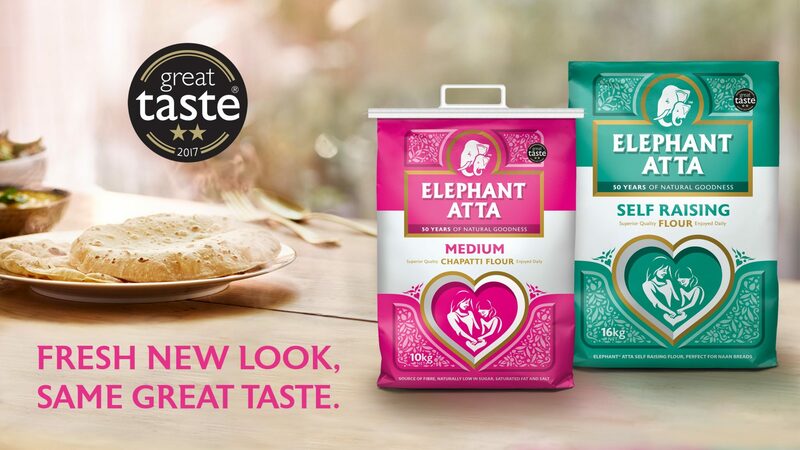 To celebrate the Great Taste Awards and the new packaging, Elephant Atta has teamed up with food blogger and Great British Bake Off 2014 semi-finalist, Chetna Makan, to provide 2 delicious recipes using both Elephant Atta Medium and Elephant Atta Self-raising flours. Visit www.elephantatta.com/recipes for Chetna’s recipes. New POS in stores and a new brand TV campaign launching early 2018 across Asian TV stations will support the new packaging.